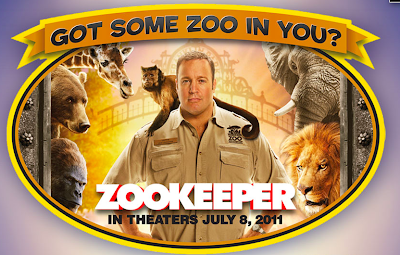 We recently went to the movies and one of the new movie trailers caught our eye - Zookeeper with Kevin James. In the movie all the animals can talk to the zookeeper (Kevin James). It looks hilarious! I wish the animals would talk to me!! Stauffer's Animal Crackers is a sponsor of the movie and has offered to giveaway one of their cute Animal Cracker Bear Jugs to one lucky Plain Chicken reader! The video reminded me of when I was a kid eating animal crackers. I would make the animal sounds for each cookie before I ate it. As an adult, I like to slather Nutella or peanut butter on the crackers before I eat them - YUM!! Come back and leave a separate comment for each one you did. You can have a total of 4 comments. You have until Friday, June 10, 2011 to enter. I will announce the winner on Saturday, June 11, 2011. So cute!!! I love animal crackers! My favorite part was the face the guy with the beard made every time he made the noises. Hilarious! I "liked" Stauffer's Cookies on FB! I "liked" Plain Chicken on FB. I would have along time ago if I had known. I love your recipes! I like the one guy's crazy beard. And that table and chairs. I'd love to have those in my back yard. If I'm eating animal crackers I better have a big jar of Nutella on hand. I like Stauffer's on facebook. I already like Plain Chicken on facebook. That's a no-brainer! I love how he has "connections" at the zoo! hahahaha! I liked Stauffer's on FB! I liked Plain Chicken on FB! Gosh, I use to eat tons of animal crackers. Love, loVE, LOVE those animal crackers! They are the BEST! My favorite part is the old school cell phone used by the zoo keeper. Haven't seen ome like that in ages!